The Health, Kinesiology and Leisure Studies program in the Department of HHPR is designed to be a flexible degree program that can address several objectives. 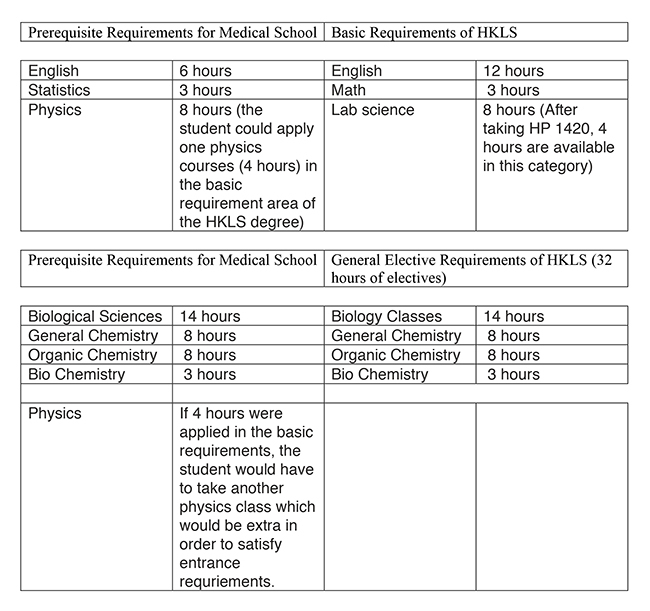 The thirty-six semester hours in HHPR courses, eighteen of which may be concentrated in one of the three areas, can be configured so that acceptable preparation results for some of the general career areas of allied health. A useful feature of this program is the thirty-two semester hours of general electives which may be used to satisfy the majority of prerequisite requirements for premedical, predental, pre-physical therapy, pre-occupational therapy, or pre-physician’s assistant entrance requirements for professional programs. The advantage of this undergraduate program is that the student can take courses which are directly linked to their major field of interest including exercise physiology, biomechanics, kinesiology, nutrition, ethics in allied health, and other courses which enhance the student’s knowledge of their particular field of choice. Students also have the option of completing a clinical internship or research internship in their junior year. Some of these prerequisites can be met by applying coursework in the basic studies area of the degree program. For example, using premedical entry requirements, the English, math, and one four-hour science course can be applied in the basic requirements of the degree. This does not endorse any school, it is intended to give examples of requirements from different areas. It is strongly suggested that the student look at the schools in which he/she is interested and access the prerequisites for those specific schools in order to apply courses to the degree program.